Grillages are a framework made of single or double tiered beams that are laid crosswise, and used to stabilise foundations. They work especially well on ground that is soft or wet. Grillages are used to secure everything from road signs to telecommunication towers. The term ‘grillage’ originates from the French word, ‘greille,’ meaning a grating of metal or steel bars. 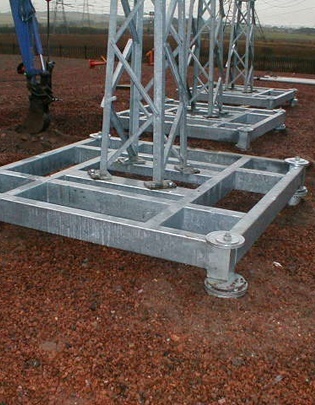 ScrewFast’s steel grillages are made from rolled steel joists, and are a fast and economic way of connecting groups of piles to a superstructure. Comprising a frame of pre-welded beams, grillages can be designed to support any structure and are extremely quick and cost effective to install. Grillages can be used with any of ScrewFast’s pile solutions. Bespoke grillages can also be designed. These foundations rigidly and securely connect the structure to the piles. A combination of fast installation and off-site fabrication makes this form of highly versatile connection an extremely popular alternative to the traditional method of using concrete to cap the piles. Using steel grillage rather than the available alternatives means that the installation can be completed quickly and conveniently. There is no need to pour concrete, which further simplifies installation. There are cost savings throughout the process due to fewer building materials, faster installation, and minimal disruption to transport. Surrounding infrastructure is also less disrupted, because we avoid the deep excavation that is necessary when foundations are created with concrete.